Each month, the team at the Earrings Everyday blog offers up a We're All Ears challenge to the blog's readers. 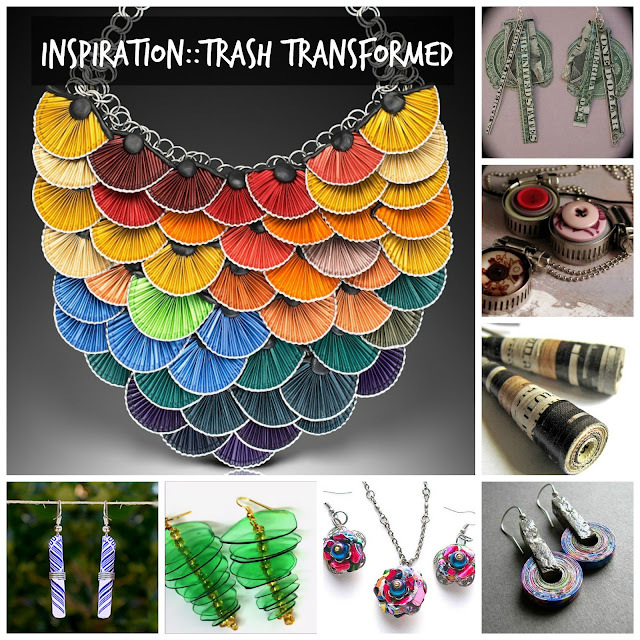 For May, the challenge is "Trash Transformed". Basically, make earrings from trash or found objects. When I read about the challenge, I knew it was right up my sleeve. However, I let the deadline (this past Friday) get away from me. I was in luck though. While looking through blogs this morning, I noticed that the linky tool was still open for a few more days. I made it my mission to make today's earrings using 'trash'. If you know me at all, you know that I often work with found objects, even going so far as to call myself a Pick Up Artist. That being said, I didn't want to work with something I already had on hand intended for jewelry-making purposes. Instead, I wanted to focus on the trash-to-treasure idea. I quickly thought through some of my options then sifted through the recycling. The bin out by the pool held my substrate: a pretty beer can from Chandeleur Brewing Company. An awl was used to punch a hole in the back of the can so that it could be cut apart. Once I had a large, flat section; I CAREFULLY washed the aluminum with soap and hot water. Then, the metal was cut into smaller, easy-to-handle sections. 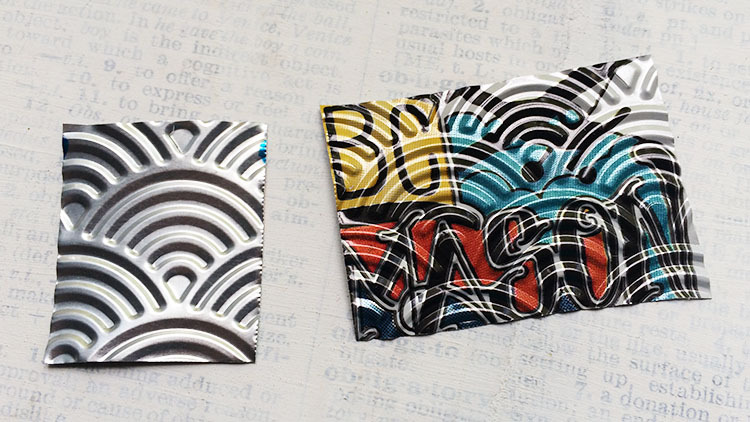 From there, I played around some by running the metal through a die-cut machine in an embossing folder. It made an amazing texture on the metal. The metal was cut into the shape/size I wanted, ensuring that there was a little extra to fold the edges. You see, since the edges of the metal were sharp and jagged, I decided to fold them all over as a safety precaution. I used pliers to fold and press down the metal and a metal punch to make holes. Then, I bent the metal around a large paintbrush to give them a curve. After that, I added beads (for weight) and ear wires. I totally dig these earrings. The bright pops of color is just what caught my eye in the first place. Oh, and so you can see the folding, here's the backs. The texture definitely adds interest, but the folding looks a little sloppy. I might considering using cans again, but perhaps in a different manner. I'm glad I decided to work with a medium I hadn't used before and experiment. 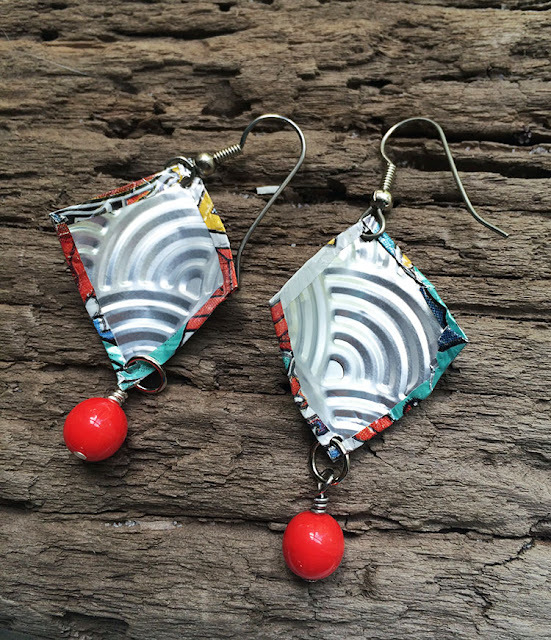 Now, go check out what the other artists who played along made at the Earrings Everyday May Reveal. I also linked these up at the Sweet Inspiration Link Party at A Crafty Mix, DIY Salvaged Junk at Funky Junk Interiors, and Saturday Sparks Link Party at Pieced Pastimes. Fabulous! I love everything about your adventure, especially the final product. Well done. Liz, Thank you! I think they're so bright and fun! I'm going to have to think up some other ways to use cans as I like the versatility, but the sharp edges have me worried. Hmmmm. Thanks for checking them out!! 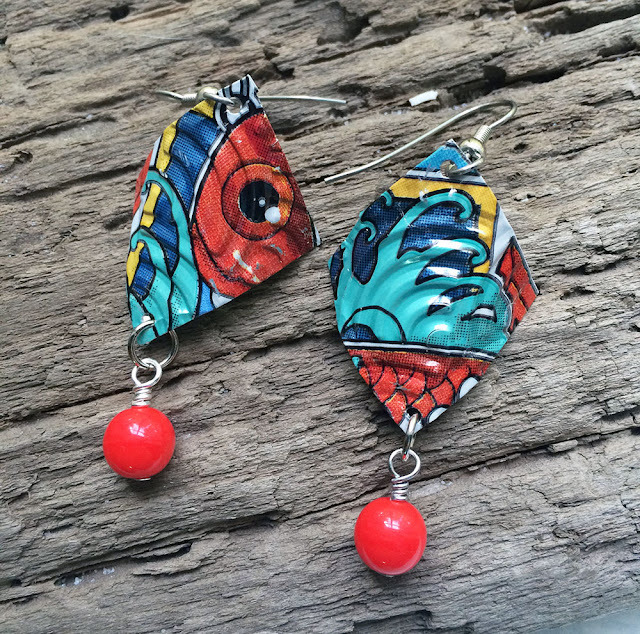 I love the colors in the earrings and the texture. 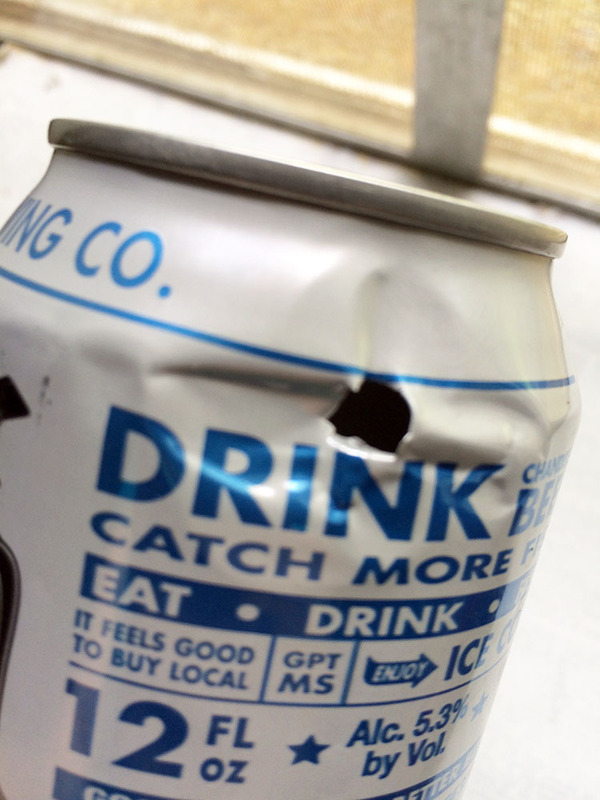 I am not familiar with the thickness of the specific cans, but I found that an ice tea can was thin enough to use a Stampin Up type punch for shaping and the edges were fine. You might try filing any rough spots and perhaps a sealant would help. I didn't make it to the challenge for lack of a real trash-to-treasute idea and I absolutely love your earrings. I was always worried about the sharp edges,too (I have only used beverage cans riveted to wooden base) and folding is a good idea. What about making a second folded piece of the same shape? The jump rings will hold both pieces together. Plus maybe some hot glue? I'm glad I stopped by and got to see these fun and funky earrings again! These are so incredibly awesome!!! These are soooooo seriously cool. I love everything about them, it's a great idea. Michelle, Thanks so much! I really love the bright colors in these and can't wait to try making something like them again. Thanks so much for checking it out! Whoa!!! This could be the most creative thing I have ever seen!!! 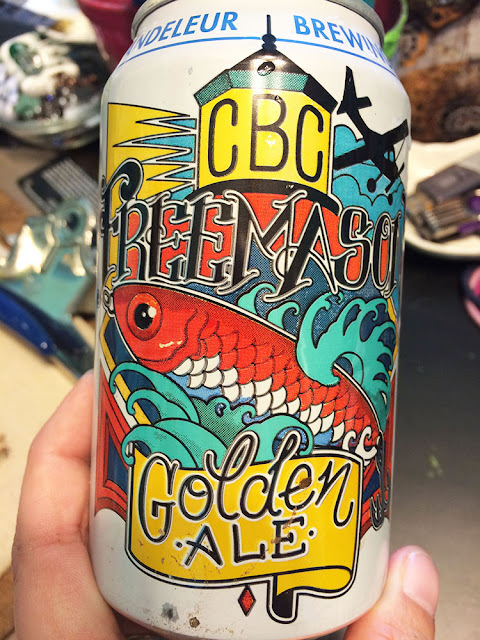 Holy Beer Can Transformation!! Fabulous Fabulous Hope! !